The mitotic failure is one of the essential sources of the genetic instability that hallmarks cancer pathology. Clinical evidence suggests that numerous proteins that regulate mitosis are aberrantly expressed in human tumors. Regulation of mitotic progression depends on two post-translational mechanisms: protein phosphorylation and proteolysis. The former process is mediated by mitotic kinases. 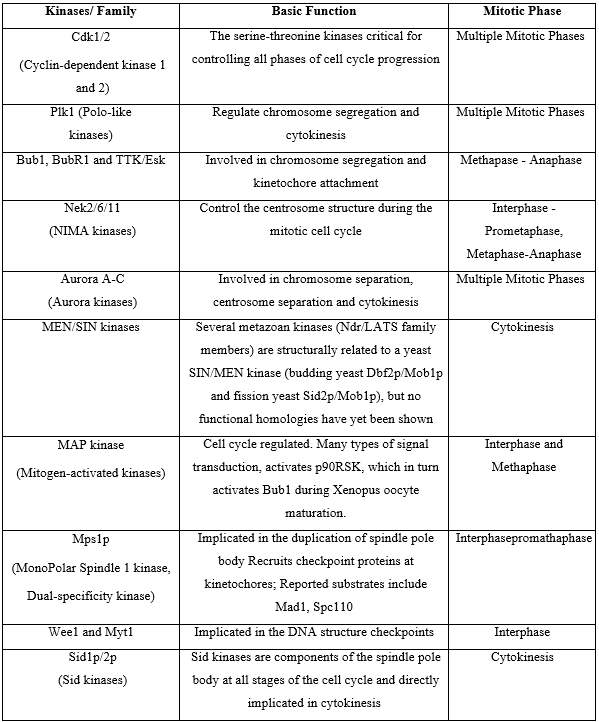 Mitotic kinases are major regulators that control mitosis progression (Table 1). The mitotic cycle includes four major stages (Fig. 2). To ensure that the daughter cells receive identical copies of the genome, progression through the cell cycle is highly regulated and controlled by different types of mitotic kinases. For example: Cdk1, Plk1 and Nek2 regulate mitotic checkpoints at the interphase and prophase, Cdk1 is one of the key players through the prophase-telophase, Aurora kinases are essential to the progression of a cell through all mitotic stages. 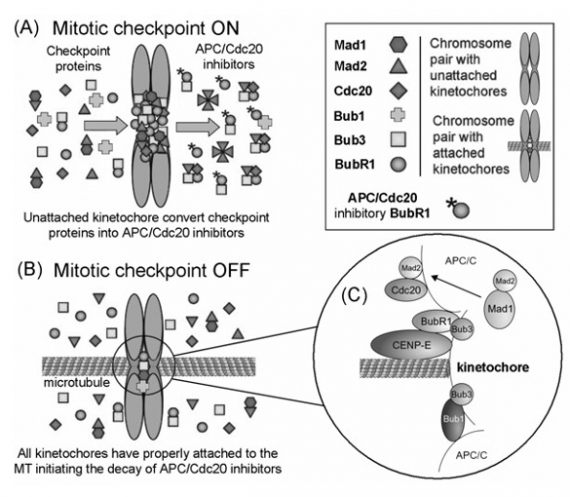 As mentioned above, mitotic kinases are key players in mitotic checkpointsiii. Thus, CDK1 mitotic kinase, a nonredundant cyclin-dependent kinase (CDK), plays an essential role in the cell division, particularly during early mitotic events (entry into mitosis). For example, loss of mitosis in tumor cells is associated with the marked reduction in CDK1 transcription and/or loss of its active form (CDK1-P-Thr(161))iv. It occurs during G2/M transition when the activity of the dual-specificity phosphatase Cdc25C towards Cdk1 exceeds activity of two opposing kinases Wee1 and Myt1. In turn, these proteins are regulated by DNA structure checkpoints, which delay the onset of mitosis in the presence of unreplicated or damaged DNA. Cdc25C is inhibited by two other kinases, Chk1 and Chk2, which are also implicated in DNA structure checkpoint signaling pathway. Wee1 and Myt1 are upregulated by the same pathwaysv. Notably, Plk1 kinase also activates Cdc25Cvi. Spindle assembly checkpoint ensures accurate segregation of chromosomes during mitosis. It blocks the anaphase stage until all chromosomes are properly attached to a bipolar mitotic spindle. Once unstable chromosomes detected, spindle checkpoint inhibits the ubiquitin ligase activity of the anaphasepromoting complex or cyclosome (APC/C)vii. This step is reportedly mediated by proteins encoded by BUB and MAD genes Specifically, mitotic kinases, including Bub1/3, BubR1, Bub3, Mad1, and Mad2 are recruited to unattached kinetochores (Fig. 3)viii. DNA replication and centrosome duplication are controlled by E2F transcription factors, Mps1p kinases, cyclin A/E and Cdc20 proteinix. Mitotic checkpoint protein complexes comprised of BubR1, Bub3 and Mad2 bind to and inhibit APC/Cdc20 until all chromosomes are properly attached to the mitotic spindle and aligned in the metaphase plate (Fig. 3A) and (3B/C))x. The ability of a cell to track its temporal and spatial fidelity during progression through the cell cycle is essential for survival. A spindle-positioning checkpoint has been initially described in the yeast S. cerevisiaexi. The first identified component of this step was Bub2/Bfa1 GTPase-activating protein (GAP). It is responsible for keeping small GTPase (Tem1p) inactive until the spindle is properly oriented. The net result is inhibition of the mitotic exit network (MEN) activationxii. The signaling cascade that is responsible for initiating MEN includes mitotic kinases that activate Cdc14p phosphatase. Cdc14p activates APC/C/Cdh1 complex, dephosphorylates Cdk1-inhibitor Sic1p (causing its stabilization) and transcription factor Swi5p (enhancing the production of Sic1p)xiii. These events lead to destruction of mitotic cyclin–CDK complexes only when the spindle-positioning checkpoint is satisfied. Considering a pivotal role of protein phosphorylation in mitotic checkpoints, spindle function and chromosome segregation, it is not surprising that several mitotic kinases have been implicated in tumorigenesis. 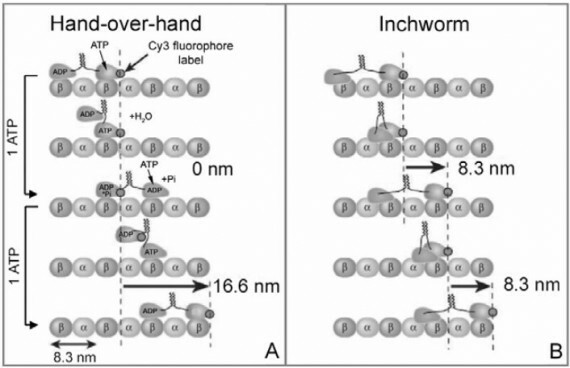 For example, CDK1-8, Aurora (Aur) (A, B, C), CDK (Cdk1, 2), Polo-like (Plk1-4), Nek (NIMA1-11), Bub (Bub1, BubR1) and other kinases are implicated in mediation of centrosome duplication, chromosome segregation, and cytokinesis in diverse human tumorsxiv. These enzymes also regulate centrosome cycle, spindle checkpoint, microtubule-kinetochore attachment, spindle assembly, and chromosome condensation. 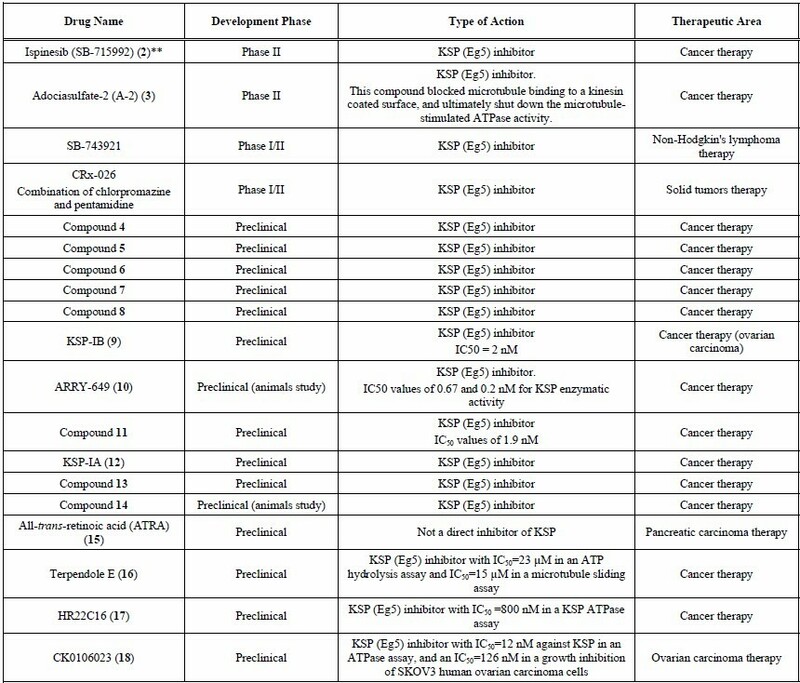 Several potent and selective inhibitors of mitotic kinases entered clinical trials (Table 2). Polo-like kinases (Plks) belong to a family of conserved serine/threonine kinases with a polo-box domain, which have similar but non-overlapping functions in the cell cycle progression. Thus, they control mitotic entry of proliferating cells and regulate many aspects of mitosis necessary for the successful cytokinesisxv. For example, they are essential for the activity of the MT organization centerxvi. They are important players in mitotic entry, spindle formation and cytokinesisxvii. Multiple Plks are present in mammalian cells (Plk-1, Plk2/Snk, Plk3/Fnk/Prk, and Plk4/Sak) and Xenopus (Plx13). 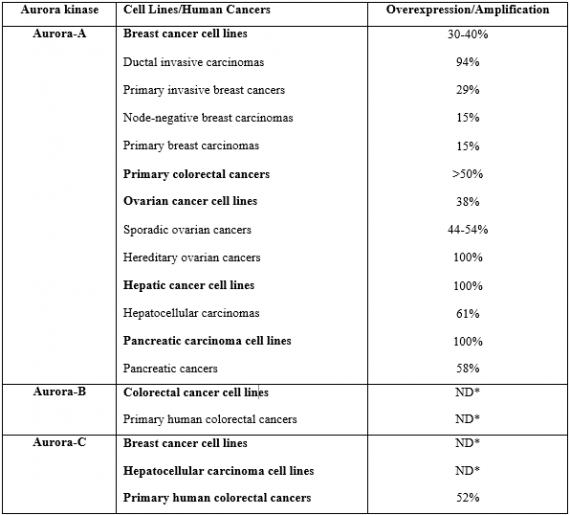 Of the four known human Plks, Plk-1 is over-expressed in many tumor types. Of all mitotic kinases, Plk-1 is probably the most validatedxviii. Studies showed that modulation of Plk-1 activity in both transformed and normal cells have anti-proliferative effect. Plks are deeply involved in the assembly and dynamics of the mitotic spindle apparatus and in the activation and inactivation of CDK/cyclin complexes. In mammalian cells, Plk1 protein levels increase as cells approach M phase, with the peak of phosphorylation activity reached during mitosis. Known substrates include Cdc25C phosphatase, cyclin B, a cohesion subunit of the mitotic spindle, subunits of the anaphase promoting complex, and mammalian kinesin-like protein 1 MKLP-1 and other kinesin related motor proteins. These substrates demonstrate the multiple roles of Plk1 in promoting mitosis. Plk1 has a role in the regulation of tyrosine dephosphorylation of CDKs through phosphorylation and activation of Cdc25C. Cancer cells treated with the Plk inhibitors undergo apoptosis or become committed to mitotic catastrophe. At the same time, non-transformed proliferating cells reversibly are arrested at the G2/M boundary. 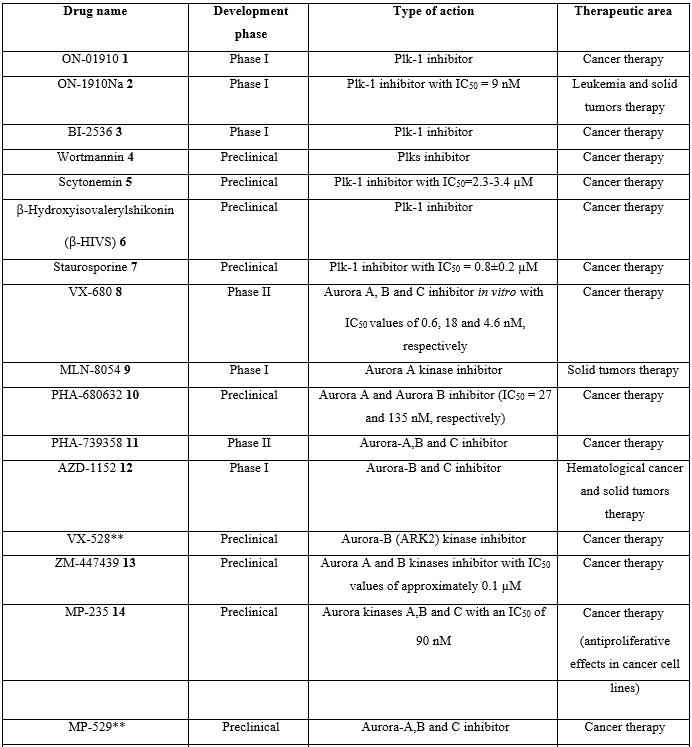 In particular, small-molecule Plk inhibitors displayed selective anti-proliferative effects on cancer cells, producing phenotypes consistent with known Plk functionsxix (Fig. 4). Structures of small-molecule inhibitors of Polo-like Kinase-1 (Plk-1) in preclinical and clinical development. Serine/threonine protein kinases of Aurora family are involved in chromosome segregation and cell division in all eukaryotesxx. They were first identified in the cell cycle studies as Xenopus Eg2xxi. These enzymes are essential in the “spindle checkpoint” system used by cells to monitor fidelity of mitosisxxii. Deregulation of Aurora kinases impairs spindle assembly, checkpoint function and cell division. It causes missegregation of individual chromosomes or polyploidization accompanied by centrosome amplification. All Aurora kinases share similar structure, with their catalytic domains flanked by very short C-terminal tails and N-terminal domains of variable lengthsxxiii. 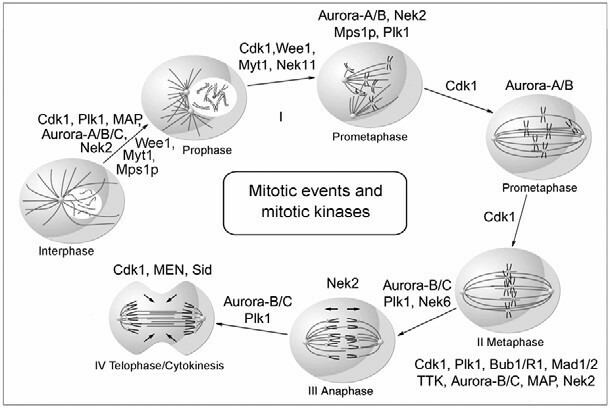 Considering that Aurora kinases regulate mitotic cycle progression at multiple mitotic stages (Fig. 2), they are believed to affect numerous proteins. For example, Aurora A phosphorylates Histone H3 (S10), KSP motor protein, CPEB, PP1, D-TACC and TPX2. Aurora B regulates activity of Histone H3(S10/S28), CENP-A, INCENP, REC-8, MgcRacGAP, Vimentin, GFAP and Desminxxiv. Aurora A is localized to centrosomes from S/early G2 phases. It is required to establish a bipolar mitotic spindlexxv. Aurora B is associated with chromosomes in early mitosis. In late mitosis, Aurora B migrates from centromeres to MTs at the spindle equator. As the spindle elongates and the cell undergoes cytokinesis, Aurora B accumulates in the spindle midzone before finally concentrating at the midbodyxxvi. Notably, all members of the Aurora-kinase family are expressed exclusively during mitosis. 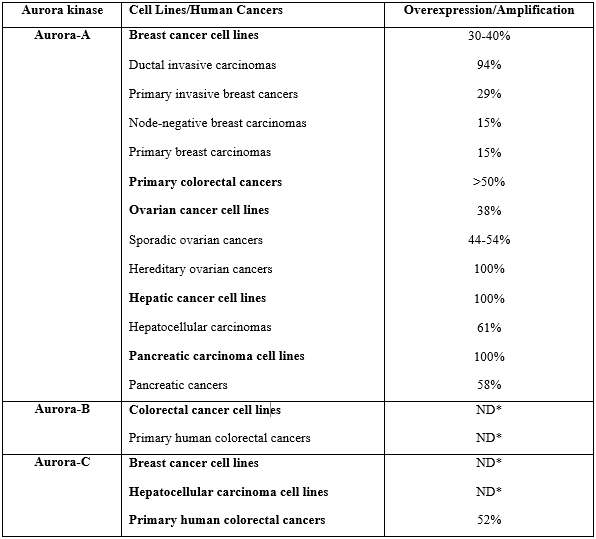 At least two isoforms, namely Auroras A and B are commonly over-expressed in human tumors, for example in primary colon tumor samplesxxvii. Further studies suggested that they play pivotal role in development of breast, colorectal, bladder and ovarian cancersxxviii (Table 3). Aberrant expression of Aurora-A kinase leads to the genetic instability via either abnormal centrosome duplication or defects in the spindle checkpointxxix. Similarly, misregulated levels of Aurora-B yield abnormalities in chromosome attachment or alignment to the mitotic spindle during cellular mitosisxxx. Aurora-B may form complexes with Survivin, anti-apoptotic protein that is commonly overexpressed in tumorsxxxi. It has been suggested that overexpression of Aurora B may help protect tumour cells from apoptosis. Since the discovery that Aurora kinases are upregulated in many tumors, several small molecule inhibitors with sufficient selectivity for Aurora kinases were developedxxxii. Figure 5 summarizes structures of selected compounds. 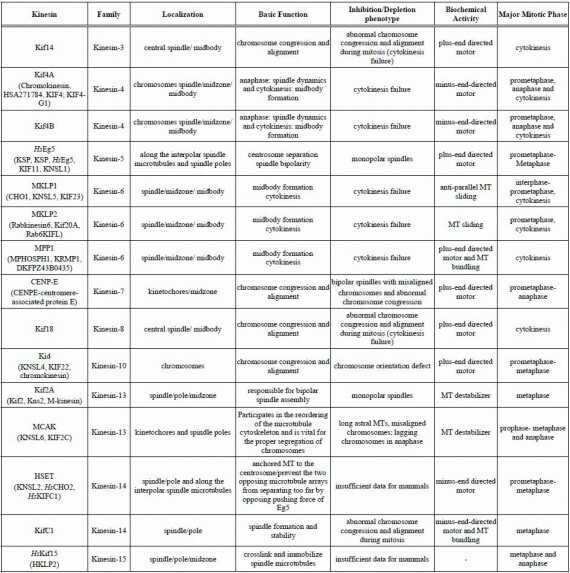 Structures of small-molecule inhibitors of Aurora kinases in preclinical and clinical development (for more information, see Table 2.). Cyclin-dependent kinases (CDK) belong to a large family of serine/threonine kinases. It is deeply implicated in cell cycle regulation especially in early stage of mitosis. They are also involved in the regulation of transcription and mRNA processing. One exception is CDK9; it plays no role in cell cycle regulation. As they are serine/threonine kinases, they phosphorylate proteins on serine and threonine amino acid residues. A cyclin-dependent kinase is activated by association with a cyclin, forming a cyclin-dependent kinase complex. The subfamily of CDKs includes several classes named correspondingly CDK1-9. A cyclin-CDK complex can be regulated by several kinases and phosphatases, including Wee, and CDK-activating kinase (CAK), and Cdc25. CAK adds an activating phosphate to the complex, while Wee adds an inhibitory phosphate; the presence of both activating and inhibitory phosphates renders the complex inactive. Cdc25 is a phosphatase that removes the inhibitor phosphate added by Wee, rendering the complex active. CDK feeds back on Wee and Cdc25 to inhibit and enhance their respective activities. CDKs are considered a potential target for anti-cancer medication. If it is possible to selectively interrupt the cell cycle regulation in cancer cells by interfering with CDK action, the cell will die. Currently, some CDK inhibitors such as Seliciclib are undergoing clinical trials. Although it was originally developed as a potential anti-cancer drug, in recent laboratory tests Seliciclib 21 (Fig. 6) has also proven to induce apoptosis in neutrophil granulocytes which mediate inflammationxxxiii. This means that novel drugs for treatment of chronic inflammation diseases such as arthritis or cystic fibrosis could be developed. 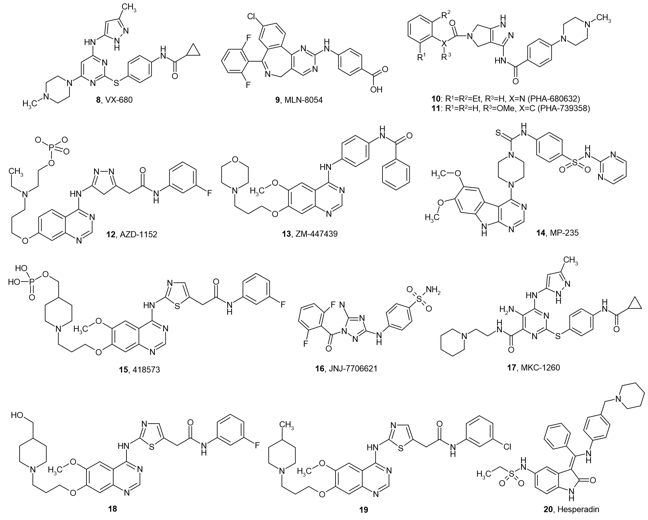 Representative structures of small-molecule inhibitors of CDKs entered in preclinical and clinical trials or already launched are shown in Figure 6. Structures of small-molecule inhibitors of CDKs in preclinical and clinical development. 1. Bioisosteric morphing and funneling procedures in designing novel potential Aurora, Plk and CDK kinase inhibitors with high IP value. We apply CDL’s proprietary ChemosoftTM software and commercially available solutions from Accelrys, MOE, Daylight and other platforms. 2. Neural Network tools for target-library profiling, in particular Self-organizing Kohonen Maps, performed in SmartMining Software. 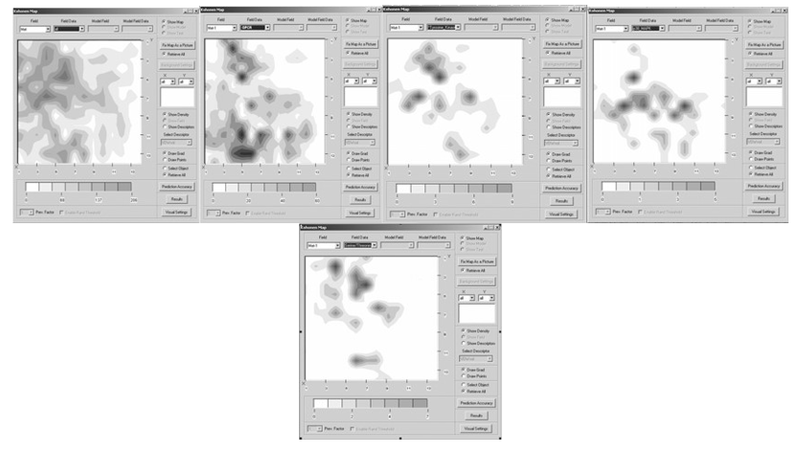 We have also use the Sammon mapping as a more accurate computational tool to create our kinase-focused library. 3. 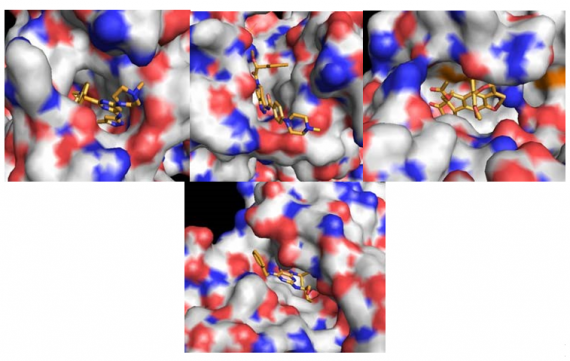 A molecular docking approach to focused library design. The fundamentals for these applications are described in a series of our recent articles on the design of exploratory small molecule chemistry for bioscreening [for related data visit ChemDiv. Inc. online source: http://www.chemdiv.com]. 2. Library activity validation via bioscreening (the synthesized compounds should be tested jointly against both Aurora and Plk kinases due to their similarity in binding site composition). SAR is implemented in the next library generation. Choosing structures that are most likely to have a predefined target-specific activity of interest from the vast assortment of structurally dissimilar molecules is a particular challenge in compound selection. This challenge has been tackled with powerful computational methodologies, such as docking available structures into the receptor site and pharmacophore searching for particular geometric relations among elements thought critical for biological activity. Both methodologies focus on conformational flexibility of both target and ligand, which is a complex and computationally intense problem. The latest developments in this field pave the way to wide industrial application of these technologies in drug design and discovery, though the limits of computational power and time still restrict the practical library size selected by these methods. Another popular approach to VS is based on ligand structure and consists of selecting compounds structurally related to hits identified from the initial screening of the existing commercial libraries and active molecules reported in research articles and patents. Although broadly used in the development of SAR profiling libraries, these methods usually perform poorly when it comes to the discovery of structurally novel lead chemotypes. An alternative design for target-specific libraries is based on statistical data mining methods, which are able to extract information from knowledge databases of active compounds. At the initial stage of our approach, we have collected a unique database which contains more than 22 thousand of known drugs and compounds which have been entered into various preclinical or clinical trials. Each compound in this database is characterized by a defined profile of target-specific activity, focused against 1 of more than 100 different protein targets. The database was filtered based on MW (not more than 800). Molecular features encoding the relevant physicochemical and topological properties of compounds were calculated from 2D molecular representations and selected by PCA. These molecular descriptors encode the most significant molecular features, such as molecular size, lipophilicity, H-binding capacity, flexibility, and molecular topology. Taken in combination, they define both pharmacokinetic and pharmacodynamic behavior of compounds and are effective for propertybased classification of target-specific groups of active agents. A Kohonen SOM (14×14) of 22,110 pharmaceutical leads and drugs generated as a result of the unsupervised learning procedure is depicted in Figure 6. It shows that the studied compounds occupy a wide area on the map, which can be characterized as the area of drug-likeness. Distribution of various target-specific groups of ligands within the Kohonen map demonstrates that most of these groups have distinct locations in specific regions of the map (Figure 6a through Figure 6e). A possible explanation of these differences is in the fact that, as a rule, receptors of one type share a structurally conserved ligand-binding site. The structure of this site determines molecular properties that a receptor-selective ligand should possess to properly bind the site. These properties include specific spatial, lipophilic, and H-binding parameters, as well as other features influencing the pharmacodynamic characteristics. Therefore, every group of active ligand molecules can be characterized by a unique combination of physicochemical parameters differentiating it from other target-specific groups of ligands. Another explanation of the observed phenomenon can be related to different pharmacokinetic requirements to drugs acting on different biotargets. During the initial stage of our focused-library design we have effectively used this model to select structures which are the most promising towards Polo-like, Aurora and CDK kinases. Based on the data derived from PDB Protein Data Bankxxxiv we have further construct and effectively applied molecular docking models to select the structures of paramount interest within the scope of our focused-library design. Molecular docking of the selected structures (see the section above) was performed using Surflex Docking computational program Version 1.24 (BioPharmics LLC). After the generation of protomol all structures were docked into the active binding site of Plk, Aurora and CDK kinases. Ten conformations for each structure were generated and docked into the binding site. There are two scores for each conformation docked: an affinity (-log(Kd)) (named as “polar”) and a “penetration score” (arbitrary units named as “penetration”). The penetration score is the degree of ligand penetration into the active site of protein studied. Thus, penetration scores that are close to 0.0 are favorable however visual analysis of each conformer is more preferable. The examples of developed docking models are shown in Fig. 7. Figure 8. The developed docking models based on: (a) crystal structure of Aurora-A kinase in complex with VX-680 (8)xxxv; (b) crystal structure of Aurora-2 kinase in complex with PHA-739358 (11)xxxvi; (c) crystal structure of Polo-like kinase-1 catalytic domain in complex with Wortmannin (4)xxxvii; (d) Human cyclin-dependent kinase 2 (hCDK2) in complex with Seliciclib (21)xxxviii. Representative compounds from our kinase-targeted library docked into the binding site of (e) Polo-like kinase (compound Plk-T-2), (f) Aurora kinase (compound Aur-T-1) and (g) CDK (compound CDK-T-3), their structures see below. For example, as shown in Fig. 7, key structural elements and atoms of Wortmannin as well as principal interactions within active site of an activated Plk-1 are significantly similar to compound PlkT-2 from our focused-library. It should be particularly noted that the catalytic domain of Plk-1 shares significant primary amino-acid homology and structural similarity with Aurora-A kinase. Therefore, biological screening against Aurora-A may provide a valuable source for compounds also active against Plk classes, especially Plk1. This suggestion has been strongly supported in a recent paper by Elling and colleaguesxxxix. Based on the obtained results we can reasonably conclude that all of the tested compounds from our focused-library are potential inhibitors of Polo-like, Aurora and CDK kinases. (4)	Novel Mitotic kinase-targeted library is synthesized according to the above criteria. (5)	The subsets of Mitotic kinase library which includes both Aurora, Polo-like and CDK kinase targeted compounds are validated by bioscreening in collaboration with academic institutions. Our strategy has proven to be efficient for generation of protein class-targeted libraries. The higher hit rate over diverse libraries, along with identification of novel active chemotypes with optimized diversity and ADME properties, has been shown in multiple studies. 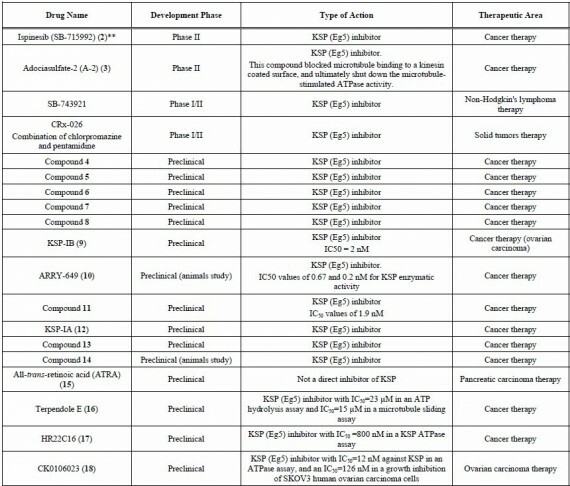 Using the computational approaches listed above we have compiled Mitotic kinase-focused library consisted of more than 5000 small molecule compounds Representative set of Mitotic kinase-biased compounds is shown below. Among a variety of anticancer drugs launched on the market and numerous compounds in preclinical and clinical development, modulators of microtubule dynamics remain to be the most important class of anti-mitotic agents. However, there are significant limitations associated with their utility. These include: drug resistance caused by mutations in β-tubulin and multiple drug resistance (MDR), toxicity, poor pharmacokinetics and poor therapeutic indexxl. These issues led to identification of an alternative targets and signaling mechanisms that yield anti-mitotic effect with greater specificity and more predictable pharmacology. Mitotic kinases represent large and relatively unexplored class of antimitotic targets. These proteins are implicated at multiple stages in the mitosis and cytokinesis. Among them Polo-like, Aurora and CDK kinases are the key regulators of a majority of mitotic checkpoints. Mps1p kinase has been implicated in the duplication of a spindle pole body and spindle assembly checkpointxli. Nek2 kinase (NIMA family) promotes centrosome separation and may control histone H3 phosphorylationxlii. MAP kinases regulate spindle dynamics and chromosome movementxliii. Mad (1p, 2p and 3p) proteins are involved in a spindle assembly checkpoint mechanismxliv. Mitotic kinases are critical for the mitotic exitxlv and cytokinesisxlvi. CDK1 kinase still remains to be one of the main enzymes in mitosis. Discovery of novel agents acting at specific phases of the mitotic cycle will allow clearer definition of the relationships between discrete mechanical phases of spindle function, regulation of cell-cycle progression and programmed cell death. Thus, here we provide efficient tools for in silico design of novel small molecule inhibitors of the title mitotic kinases. Based on the accumulated knowledge base as well as unique structure- and target-based models we have been designed more than 5000 small molecule compounds targeted specifically against Polo-like, Aurora and CDK kinases. As a result, the library is renewed each year, proprietary compounds comprising 50-75% of the entire set. Clients are invited to participate in the template selection process prior to launch of our synthetic effort. Another significant limitation of current modulators of tubulin dynamics is their marginal clinical efficacy. While demonstrating impressive in vitro activity, majority of tubulin-binding agents have not displayed antitumor activity in clinic. This fact is usually attributed to poor balance between efficacy and toxicity, so-called therapeutic window. It is related to multiple features of a drug including pharmacokinetics, off-target toxicity and other poorly recognized factors. In addition, drug efflux pumps play a role in tumors developing resistance to the tubulin-binding drugs. For example, vinca alkaloids and taxanes are both substrates for the P-gp efflux pump encoded by the multidrug resistance mdr1 gene, resulting in decreased sensitivity to these compounds in vivo.lv Typical MT-targeting drugs exert anti-mitotic effects by changing spindle microtubule dynamics. Alterations in a total tubulin or tubulin isotype content furnish compensatory effects. For example, changes in tubulin expressionlvi and mutations in β-tubulin can affect Paclitaxel™ driven polymerization.lvii Therefore, there is ongoing need for the modulators of other intracellular targets that result in the same anti-mitotic effect without adverse effects of “traditional” tubulin binders. Due to these limitations of the tubulin-binding antimitotic agents, there is ongoing need to identify other targets that yield anti-mitotic effect with better specificity and more predictable pharmacology. For example, kinesins, microtubule motor proteins play critical role in the mitotic spindle function and represent potential targets for the discovery of novel cancer therapies.lviii Proteins that control cellular progression through mitosis include kinases and cysteine proteases, namely Polo, Bub, Mad, Aurora, Cdk1, separase and others.lix The significant role of mitotic kinases was partly elucidated within the description (Part I) which supports the ChemDiv antimitotic library. Here we provide the CL consisted solely of mitotic kinesin- and separase-targeted agents. The formation and proper function of the mitotic spindle depend on the dynamic properties of MT and function of MT-dependent motor proteins. Motor proteins can be defined as molecular machines that convert chemical energy of ATP hydrolysis into mechanical work used to power cellular motility (i.e. force and motion).lx For example, motors can crosslink and slide overlapping antiparallel MTs within interpolar MT bundles to position spindle poles in relation to one another. Mitotic motors reportedly use at least three distinct mechanisms to perform their function.lxi These are: (1) crossbridging and sliding MTs relative to adjacent MTs or other structures; (2) transporting specific mitotic cargoes along the surface lattice of spindle MTs; and (3) regulating MT assembly dynamics and coupling movement to MT growth and shrinkage. Specific mitotic movements are not driven by individual motors. Instead they are a result of shifts in dynamic balance of complementary and antagonistic forces generated by multiple motors functioning cooperatively. Motor proteins are involved in organizing MTs into a spindle and in moving chromosomes. Some motor proteins play direct role in assembling the spindle and linking its components into a coherent unit. Others are responsible for attaching chromosomes to the spindle and cortex generating forces for their motions. The unremitting toil of motor proteins is observed along microtubules between the poles and the chromosomes, at the kinetochores and along the arms of the chromosomes. Many types of motors are detected in a single location, whereas some of them are found in several different places. There are more than 45 different kinesins in humans. They are separated into three major classes according to the motor domain localization and their amino acid sequence.lxii Kinesins with Nterminal motor domains (“+” directed motors) move predominately towards the plus end of microtubules. Kinesins with C-terminal motor domains (“-“ directed motors) migrate towards the minus ends. Kinesins with centrally-located motor domains destabilize ends of MTs. Outside the motor domains, kinesins are quite divergent.lxiii Majority of these proteins are homodimers with identical ATPcatalytic cores (heads).lxiv Each head is connected to the “necklinker,” a mechanical element that undergoes nucleotidedependent conformational changes that enable motor stepping.lxv The mechanistic pathway of kinesin movement was detected using a FIONA (Fluorescence Imaging One-Nanometer Accuracy) protocol.lxvi Using this technique, two models of kinesin movement have been postulated: the hand-over-hand “walking” model in which the two heads alternate in the lead (Fig. 1A),lxvii and an inchworm model in which one head always leads (Fig. 1B)lxviii. Mitosis is a set of ordered mechanical events (I-IV): I, microtubule capture and spindle pole separation; II, chromosome alignment; III, anaphase chromosome movement; IV, telophase and cytokinesis (Fig. 2A). During mitosis, kinesin-like motors perform several basic functions illustrated within Fig. 2B. Some of them, such as Kif2A and highly conserved role in spindle pole focusing and spindle length determination. In eukaryotes, this protein localizes to spindle poles and spindle microtubules. Electron microscopy suggests that HSET localizes between microtubules in parallel bundles.lxxv HSET prevents two opposing MT arrays from separating by opposing pushing force of Eg5. As briefly discussed above, tubulin binding agents feature serious side effects related to the universal role of tubulin in important cellular processes such as the maintenance of organelles and cell shape, cell motility, synaptic vesicles, and intracellular transport phenomena. In addition, application of tubulin-binding agents is limited by drug resistance.lxxvii From this point of view, small molecule inhibitors of mitotic kinesins represent promising class of anticancer drugs. In the past few years a number of kinesin-targeting agents were found. Several inhibitors are currently in clinical developed as anti-cancer agents (Table 2, Fig. 3). Small-molecule inhibitors of kinesin-like proteins in preclinical and clinical development*; *data at the mid of 2006; ** structure number in Fig. 4.